Model United Nations is a big deal at a lot of international schools. Participants role-play as UN delegates. They debate and vote on resolutions concerning human rights, security, economics, health, and other matters of global importance. My daughter Alekka is a 10th grader at ICS. She became interested in MUN when we were in Bosnia. Our school in Damascus didn’t have a club (you can’t very well debate issues you aren’t allowed to mention out loud) but tiny little QSI Sarajevo boasted an active and successful team. The highlight of their year was a conference in Budapest with sessions in the gorgeous Hungarian parliament building. Alekka’s best Bosnian buds were involved and having a marvelous time; unfortunately we arrived too late in the year for Alekka to join them. 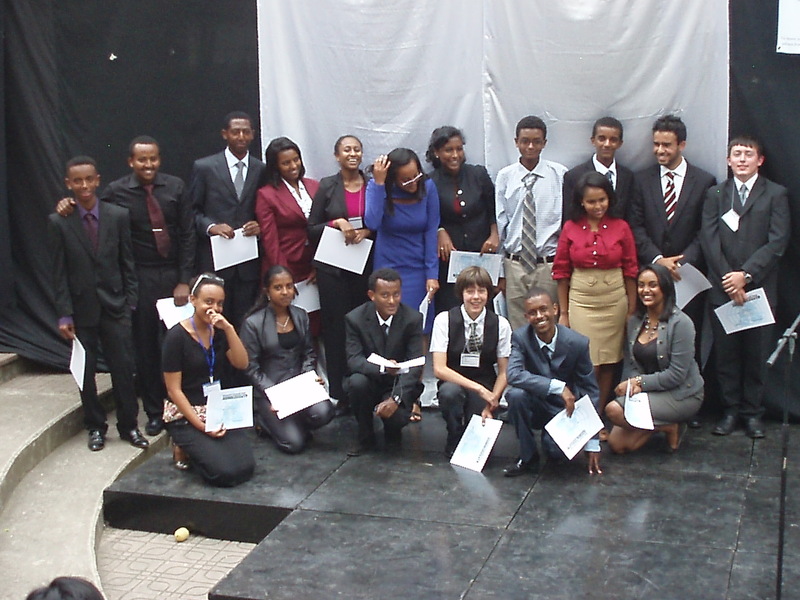 So Model UN was Alekka’s first pick for after-school activities when we came to Ethiopia. The team needed an assistant coach, and Andreas volunteered. Sisay, the head coach, has worked for several years to develop not only a top-notch competitive team but one that serves a leadership role in developing Model UN programs with less privileged schools in Addis Ababa and beyond. This past weekend, ICS hosted a local conference at our school. Sign in our parking lot advertising the event. All the international schools in Addis were there, as well as a couple of national schools and two college teams that are just getting started and wanted to get some practice. At the end of the day, a recognition for some of the most successful delegates. Alekka was excited that her resolutions for Sudan were adopted, but she says her speech skills need work before she’s ready for a big-time conference. The ICS team hopes to travel to Delhi this spring, and plans are in the works now for hosting a high-profile Addis Ababa conference next year. 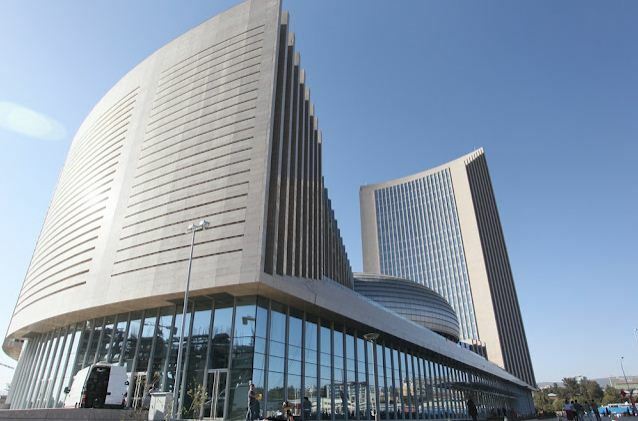 Sisay and Andreas are thinking big: they want to hold it at the new African Union headquarters. 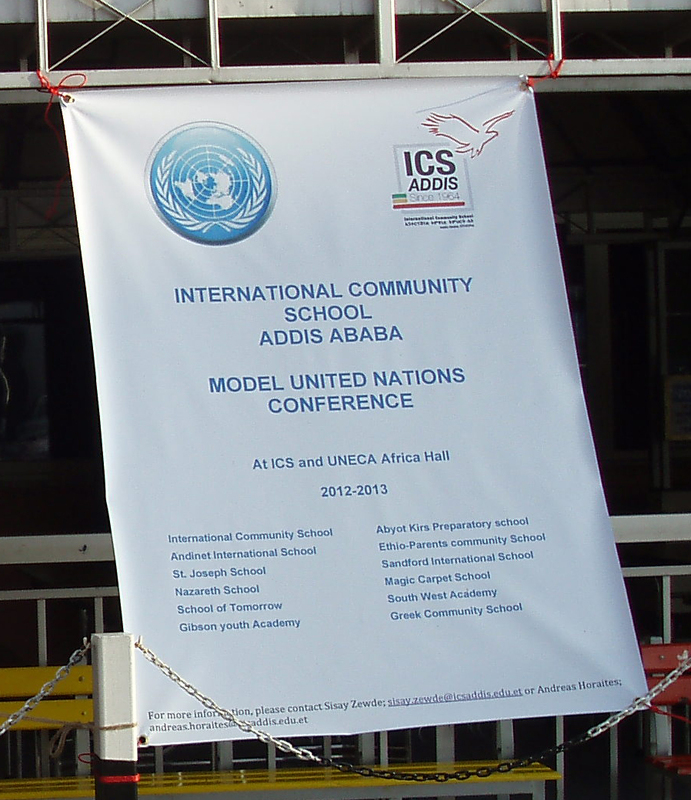 This entry was posted in Addis Ababa, International Community School, Teaching and tagged model UN, Model United Nations, MUN. Bookmark the permalink. I used to do Model UN and really enjoyed it. I even ended up going to Washington DC for a Model UN once.